Please visit New Student Central for more information on the application process, campus resources, and more information about Residential Life at UConn! Please visit New Student Central for the specific steps on how to apply for housing. Where can I learn more about the Residency Requirement? Please visit the Residency Requirement Information page for the specific steps on the residency requirement and who is required to live on campus for the 2019-2020 academic year. How will you consider my medical needs when making my assignment? appropriate documentation regarding the disability at the Center for students with Disabilities (CSD). Students who request a housing accommodation must meet all Residential Life deadlines (including application deadlines). The CSD staff will determine if an accommodation is necessary and if so, make a recommendation to Residential Life. for Fall 2019 and December 1, 2019 for Spring 2020. Where do new students live on campus? adjust to college life and transition to community style living. likely to be assigned into triples/quads. Where do Honors students live? The Honors first-year community is located in Buckley and Shippee Halls. Continuing Honors students have the opportunity to live with other Honors students in clustered living environments in Shippee Hall, Brock Hall (Alumni), Snow Hall (South Campus) or in the newly built Werth Tower on a space-available basis. Honors students may be allowed to pull-in a non-Honors roommate depending on space availability. Where do International & National Exchange students live? All International Exchange and National Exchange students reside in undergraduate housing areas throughout campus. Exchange students typically live with a current undergraduate student. When can new students move in? For Fall 2019, newly admitted freshmen (and their siblings) can begin moving in on Friday, August 23, 2019. All other students, including newly admitted transfers, can begin moving in on Saturday, August 24th, 2019. Early arrival information for residents who need to arrive prior to August 23/24 will be available in the assignment/check-in information email sent to new students in August. When can I request a roommate? Roommate requests for Fall 2019 will be accepted June 1 - July 19, 2019 in MyHousing. Complete instructions will be available in May 2019. Only mutual requests can be considered. Due to the limited number of completely vacant rooms in the Spring semester, we are not accepting roommate requests for the Spring 2020 semester. Specific information about the roommate request process is available on Storrs New Student Central. How can I request to live with a current UConn student? Continuing students will have the opportunity to request to live with a specific incoming student (first year and new transfer students) for Fall 2019 during the summer. Continuing students should still select housing during their selection process in Spring 2019, but must be willing to change assignments during the summer if our staff is not able to place an incoming student in your selected room. Students who are requesting to live with a current UConn student must email livingoncampus@uconn.edu between June 1 and July 19, 2019 and state that they are willing to be relocated to another space on-campus in order to live with the new student. Please also provide your full name/7 digit student ID number and the full name/7 digit student ID number of the new student you are requesting to live with. Only mutual requests will be honored--both the new student and the current student will need to email our office. How can I get a room change? During each semester, and between the Fall and Spring semesters, there is a room change process. Information about these processes will be sent to your UConn email account and advertised on our website. New students will have a room change process in August before they arrive to campus. More information on this process will be sent out to students in late July and advertised on our website as well. Please note that this room change process will be based on available vacancies and may not include rooms in every housing type or campus area. I want to be in a specific hall or learning community, how can I do that? We do not accept specific room requests on our housing application but we do allow students to provide their highest rate preference. Residential Life will not place students into an assignment that is more expensive than the rate they indicate on their housing application. Please note that all placements are based on vacancies and while we do our best to meet a student's preferred rate, we cannot guarantee that a request for a specific room rate will result in placement in a room type that matches that rate. The majority of housing for first year students will be in traditional doubles (Rate 1). When will new students be notified of their assignments? New students will be notified of their housing assignments by August 1, 2019. We will first release the news that assignments are visible on our social media pages, so make sure that you like and follow UConn Residential Life on Facebook, Twitter, and Instagram so that you don't miss out! Please make sure that you have watched our MyHousing tutorial to learn more about the features within MyHousing. If you have questions after watching this tutorial, please feel free to email livingoncampus@uconn.edu so that staff can assist. If you were admitted very recently, it may take 3-5 business days after your enrollment deposit is received before you will have access to MyHousing. Is any area better to live in than others? Students find benefits in each residential area. The single most important factor in determining a student’s level of happiness on campus is a willingness to communicate and compromise with roommates and floor-mates. Rooms vary in size throughout the campus but doubles are generally between 154 sq. ft. and 180 sq. ft. Triple and quad rooms are larger to accommodate the additional students. What if I don’t want furniture in my room? Unfortunately, the residence halls do not have adequate storage facilities for students to store furniture, and university furniture cannot be taken off site. Students will be held responsible for the furnishings in their room. If there is a concern about the furnishings or if a repair needs to be made, you can submit a work order by contacting Work Order Control at (860) 486-3113 or online at www.residentialservices.uconn.edu. While most rooms in the residence halls have tile floors, some still have carpet. You may purchase an area rug to fit your room at a variety of retail locations including the UConn Bookstore. Room dimensions vary from hall to hall, as well as within halls. Check with your roommate(s) before purchasing a rug as some students with allergies cannot live in carpeted rooms. Residents can have guests! Just remember you should always consult with your roommate and adhere to the guest guidelines in the housing contract. Many students choose to study in their residence hall rooms while others find that the library is a more effective place to study. During other hours, the noise level must not interfere with the rights of residents who want and need to study at that time. Does UConn offer housing during the break periods? All areas are open over Thanksgiving and Spring Recess. Winter Recess housing is available - an additional housing fee may be assessed for residents who remain during Winter Recess. Living with someone is a great opportunity to develop life-long relationships, even though it can be a challenging new experience. Before August 1st, students complete the Sharing Spaces Module online, which includes tips on fostering a positive roommate relationship (available Summer 2019). Students who experience difficulties with their roommate(s) are encouraged to seek out help from their HD (Hall Director). HDs are professional staff members trained to assist students in resolving conflicts with other students. 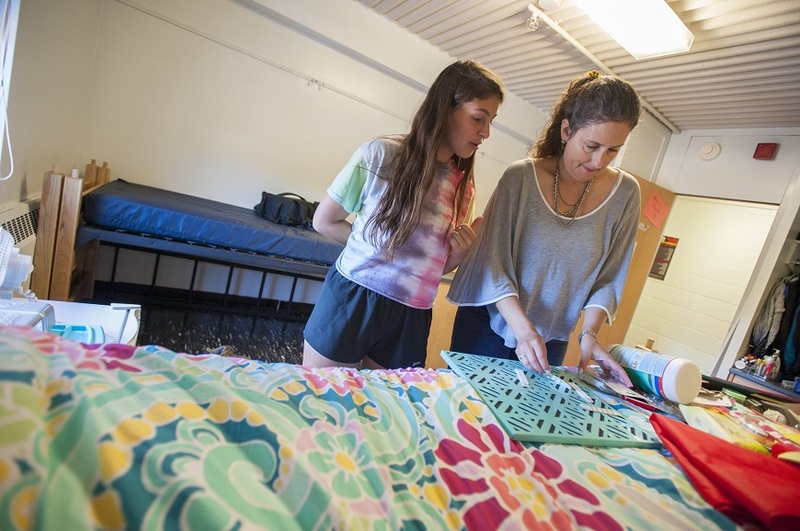 Students can also choose to participate in up to five different room change processes held throughout the year, including the online process in August before move-in day. Please note that we still encourage students to connect with Hall staff if they have roommate concerns, as sharing space with another student is an experience that continues throughout their entire time at UConn and may not always be remedied by a room change. What should I bring to campus? Are there things I can’t bring? Please visit our Items to Bring List for general thoughts on what students like to have in their rooms. We encourage you to speak with your roommate(s) to make sure that you are not duplicating efforts. We find that students who purchase the majority of these items after they arrive on campus/partially move-in are best able to identify what items they would like to use to furnish their room. Each room is slightly different on campus and we do not provide measurements of closets, windows, walls, or other room features. Please note that there are specific items that are not allowed in on-campus housing. A full list is available in the Housing Contract. I didn’t get into the Learning Community I applied for, what happens now? Learning Communities have a fixed number of rooms and are not always able to accommodate every student who requests a place in one. Any student who is not in a Learning Community will be placed by our office. The majority of students who are not in Learning Communities will be in Towers or Northwest. Will my housing come with a bike rack? What other amenities can I use? Each campus area has its own amenities and features. Please click on "Housing Options" and find your campus area's website. Each page will detail specific amenities and other features that students enjoy using. What is the general timeline for housing new students? Move-in day for freshmen will be Friday, August 23. New transfer students will be able to move in starting on Saturday, August 24. Do my parents/guardians have access to my personal records/information at UConn? The Family Educational Rights and Privacy Act (FERPA) prohibits universities from talking about students’ records with anyone but the student. This includes financial aid records, housing records, transcripts and all other university records that have student names on them. Students can give a parent or guardian access to some or all records through the On-Line FERPA Waiver. For more information please visit www.ferpa.uconn.edu. It is strongly encouraged that students fill out this waiver before an emergency or incident occurs so that information can be provided to the designated contacts. How can my family member get updated on general Residential Life processes? Residential Life posts periodic updates and newsletters for parents and family members of our residents online at www.reslife.uconn.edu. To receive an email informing you when these updates are posted, or when important deadlines or processes are approaching, please provide us with your email address by following the steps below. Option 1 – Include parent/family email address on housing application. Add livingoncampus@uconn.edu to your safe email sender list. Emails returned because livingoncampus@uconn.edu is not a “safe sender” will not be re-sent. If you submit your email to livingoncampus@uconn.edu, a confirmation email will be sent once your email address has been recorded. Is there a page dedicated to parents and family members on your website? Yes! Please visit the Parent and Family Information page for additional links, resources, and parent/family newsletters to update you one what your student is experiencing on campus and updates on processes or future opportunities! What is the duration of the housing contract? Students who submit a housing application are bound to the terms and conditions of the housing contract for both semesters (fall and spring terms). The occupancy period is for the full academic year; cancelling the contract to live off campus may result in a financial penalty. Who is guaranteed housing, and for how long? All students desiring on-campus housing must apply and meet all housing deadlines each year. Students entering as freshmen (admitted with housing) are guaranteed four (4) semesters of housing. A student who declines or cancels housing forfeits any guarantees for future on-campus housing. On-campus housing is not guaranteed for four (4) years. Students who apply after all available spaces are filled are placed on the waiting list and only offered housing if spaces become available. The Office of Off-Campus Student Services is a helpful resource for students researching off-campus housing options - www.offcampus.uconn.edu. What kind of internet access is available in the residence halls? What is the easiest way to get around campus? Everything on campus is within walking distance. However, the bus system is a convenient alternative. The schedule can be found at www.transpo.uconn.edu#huskyrides. Bicycle racks are also available throughout campus for individuals who wish to bring a bicycle to campus. Can I bring a car with me to campus? Qualified individuals are required to register their vehicles with Parking Services, pay a registration fee, and display a valid permit. For more information, please call Parking Services at (860) 486-4930 or visit www.park.uconn.edu. What transportation is available after the buses stop for the night? The Husky Rides Service, which operates out of Transportation Services, offers transportation to students after bus service ends each night. Additional information, including hours of operation, can be found at www.transpo.uconn.edu. More information on the U-PASS program is available at https://transpo.uconn.edu/u-pass-ct/. Residential Life utilizes the UConn email system exclusively to communicate with students on a regular basis. It is important to regularly check this email account to stay informed about important housing related updates. Students will receive their housing assignments in their UConn email accounts. Residential Life is not responsible for email messages not received by students. All state-owned buildings, including residence halls, are smoke-free per Connecticut State Law. Residential Life collects information on smoking preferences in an effort to facilitate compatible roommate pairings, when possible. Connecticut State Law requires all students residing in university-owned housing be vaccinated against meningitis or submit immunization exemption information. Before students move in, they must fulfill the meningitis requirement by receiving the immunization at Student Health Services, providing documentation that they have previously received the shot within the last 5 years, or by filling out an exemption form (medical/religious reasons, or student 29 or older). Please visit https://shs.uconn.edu for more information. The alcohol policy can be found in the Student Code at https://community.uconn.edu. In accordance with state law, students who are under the age of 21 are not allowed to possess or consume alcohol. While we do not have any official “SubstanceFree” housing, no alcohol is permitted in any room where both roommates are under 21. Illegal substances are never allowed at UConn. Safety and security is the shared responsibility of all community members. The UConn Police Department’s primary mission is the protection of lives and property at the University of Connecticut and all adjacent areas within the jurisdiction of the University. All residence halls are locked 24 hours a day; students must use their ID card or a foyer key to gain access to the building. Security screens are on most ground floor windows. You should always lock your door when you are not in your room. Most thefts from residence hall rooms occur when students leave their doors unlocked. You can also purchase locking devices for computers and printers, locking them to each other or a larger item in the room. Resident Assistants are on duty weeknights from 7:00 pm -7:00 am and on weekends from 7:00 pm on Friday evening to 7:00 am Monday morning. There is always a professional Residential Life staff member on duty for the residence halls as well. Recycling and trash stations are located in each of the traditional residence halls and suites. Apartment residents can take their trash and recycling to a collection point outside their building. Students, staff, and faculty can place recyclable material in any recycling container on-campus and can rest assured that the materials will be properly recycled.